Below are segments from genetic testing reports from two different companies referring to this issue. Is it true that 5-HTTLPR polymorphisms can predict who will or will not respond to an SSRI? — having remission with an SSRI (odds ratio 1.5). So, the odds of response with the L allele are only a little bit better than those without an L allele. We should be clear that the S/S polymorphism only predicts a slightly lower probability of response to an SSRI. It does not mean, as the genetic testing report shown above seems to claim, that there is a “high risk of non-response,” or that an SSRI should not be used. Let’s help our patients to understand this as well. But there are five factors that moderate this effect and in a subgroup of patients, the difference in response rates between the S/S and L/L genotypes becomes greater. The association between 5-HTTLPR and response to antidepressants applies only to SSRIs. The difference between the response rates with the L/L genotype compared to S carriers was greater with increasing age at onset of illness (Porcelli et al., 2010). The difference between the response rates with the L/L genotype compared to S carriers was greater with increasing age at the time of the study (Porcelli et al., 2010). So, for a Caucasian female who is older, whose illness started at a later age, and who is homozygous for low-expression alleles (S orLG), the response rate with an SSRI is likely to be lower than if she was homozygous for high-expression alleles (LA/LA ). However, we don’t know exactly how much the probabilities are. If you are disappointed that 5-HTTLPR polymorphisms are not very useful in predicting response to SSRIs, let me note that these polymorphisms are much more useful in predicting side effects with SSRIs. That is discussed on another page (see Related Pages below). Porcelli S, Fabbri C, Serretti A. Meta-analysis of serotonin transporter gene promoter polymorphism (5-HTTLPR) association with antidepressant efficacy. Eur Neuropsychopharmacol. 2012 Apr;22(4):239-58. PubMed PMID: 22137564. 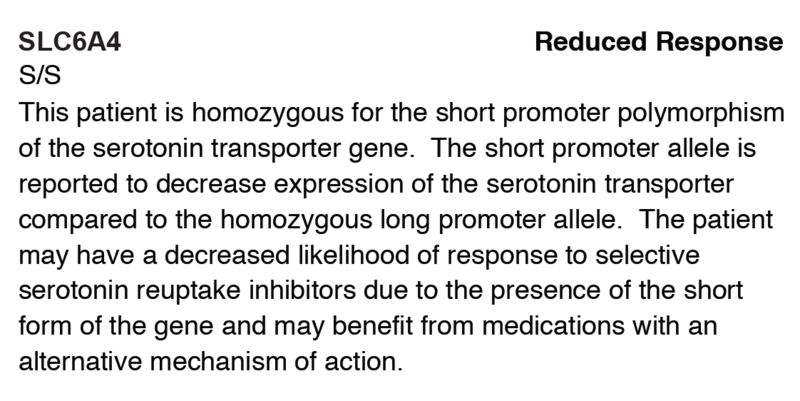 Serretti A, Kato M, De Ronchi D, Kinoshita T. Meta-analysis of serotonin transporter gene promoter polymorphism (5-HTTLPR) association with selective serotonin reuptake inhibitor efficacy in depressed patients. Mol Psychiatry. 2007 Mar;12(3):247-57. Epub 2006 Dec 5. PubMed PMID: 17146470. Smits KM, Smits LJ, Peeters FP, Schouten JS, Janssen RG, Smeets HJ, van Os J, Prins MH. The influence of 5-HTTLPR and STin2 polymorphisms in the serotonin transporter gene on treatment effect of selective serotonin reuptake inhibitors in depressive patients. Psychiatr Genet. 2008 Aug;18(4):184-90. doi: 10.1097/YPG.0b013e3283050aca. PubMed PMID: 18628680. Thanks, Dr. Freedman. That was a very good suggestion. I have now added that information to the article above.